The key factors in buying a hard drive are drive type (internal, external, portable, network-attached, or solid-state) and capacity. Beyond that, most shoppers look at price, not at extra features. Here is what we found for hard drives. For buying hard drives, Amazon edged out Newegg among online-only sellers to finish first overall. Both scored very high on hard-drive selection and price; in fact, models often sold for $20 to $30 less at Amazon and Newegg than at other stores and Websites. Among brick-and-mortar stores, Best Buy, which came in second on the overall chart, delivered the best shopping experience. Best Buy employees generally answered our questions accurately or admitted that they didn't have an answer. At the other end of the spectrum, RadioShack carries almost no hard drives, and Sears sells most of its drives through third-party partners via its convoluted, poorly designed Website. Most online retailers inundate you with hard-drive options. 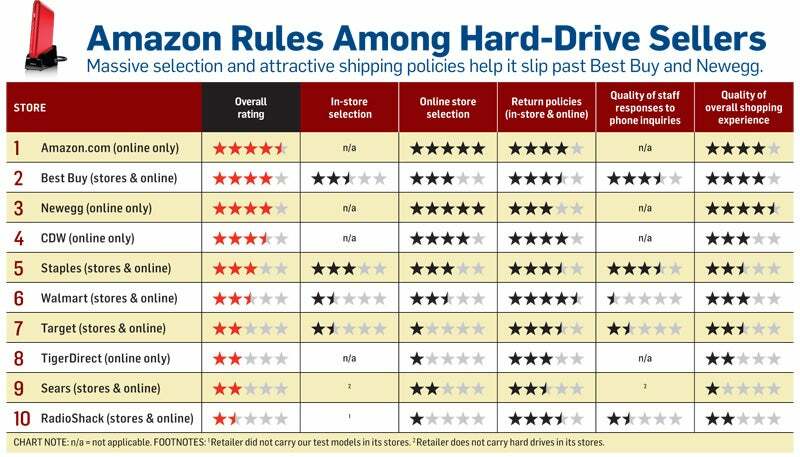 The top-rated sellers--Amazon, Best Buy, Newegg, CDW, and Staples--had selections of 400 to more than 1000 drive models. CDW offers a wide selection of drives; but the site is a bit too detailed to be easy to use, and its prices tended to be high. Best Buy and Target have fewer options at their Websites, and their pricing online is the same as at their physical stores. Staples finished slightly ahead of Best Buy for in-store selection: One store we visited had especially strong offerings of portable and desktop external drives, as well as several single-bay network-attached drives. Other Staples stores we checked were less well-stocked, however. Both Walmart and Target offered a modest selection of drives in-store--usually limited to models from two or three manufacturers (Hewlett-Packard, Seagate, and Western Digital). Relying on your local megastore is chancy. For instance, a California Walmart we visited had several Seagate and Western Digital drives in stock, but a Florida Walmart had fewer options and its shelves looked picked over. Other Walmarts couldn't answer our questions or had no drives in stock and referred us online. Walmart's Web store makes getting to options easy; but browsing by price or capacity is harder. We asked each store about the availability of four hard drives: The Intel X-25 M SSD (160GB), the Iomega eGo Portable Hard Drive (500GB), the Seagate BlackArmor NAS110 (1TB), and the Western Digital My Passport Elite (640GB). Q: Will this hard drive work properly with a Mac? A: Maybe. It will if it's formatted for the Mace HFS+ file system or if it's formatted as FAT32, which works with both Macs and PCs. 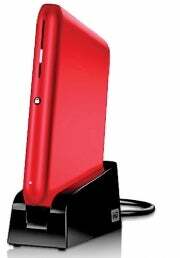 Most often, a drive comes formatted for Windows' NTFS file system and is PC-compatible only. You can reformat any drive, but the process isn't dead simple. See "Technology's Most (and Least) Reliable Brands"--our annual reader survey of reliability and service for tech products. 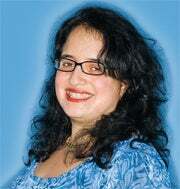 Senior Editor Melissa J. Perenson is a member of the PCWorld Reviews staff, where she covers storage, among other products.